Dr. Yaremchuk has vast experience in the reconstruction of facial deformities, with a special interest in the cranio-orbital area. In March of 2006, Dr. Yaremchuk lectured on "Craniofacial reconstruction with prefabricated implants" at the French meeting - Les nouvelles imageries en chirurgie maxillo-faciale Congres de L'association Francaise des Chirurgiens Maxillo-Faciaux. He also presented this work at the Forum de Cirurgia e traumtologia Buco-maxilo-Facial de Rio deJaneiro in November of 2006. Most recently, Dr. Yaremchuk performed live surgery correcting a post traumatic cheek and orbit eformity for the benefit of Russian plastic surgeons a Russian - American Conference on Craniofacial Surgery in Moscow. In September of 2015 Dr. Yaremchuk and Dr. Chad Gordon will co-chair a symposium in Boston on Cranioplasty. * This Graves Disease patient (overactive thyroid gland) suffered from severely swollen eyes. She was unable to close her eyes and lived in constant pain. By increasing the volume of her eye sockets and building up her orbital rims, Dr. Yaremchuk both improved her appearance and eliminated her eye pain. * This patient suffered from severe eye socket (nasoethmoidal) fractures, which increased the distance between her eyes, destroyed the bridge of her nose and caused her right eye to sink in (enophthalmos). 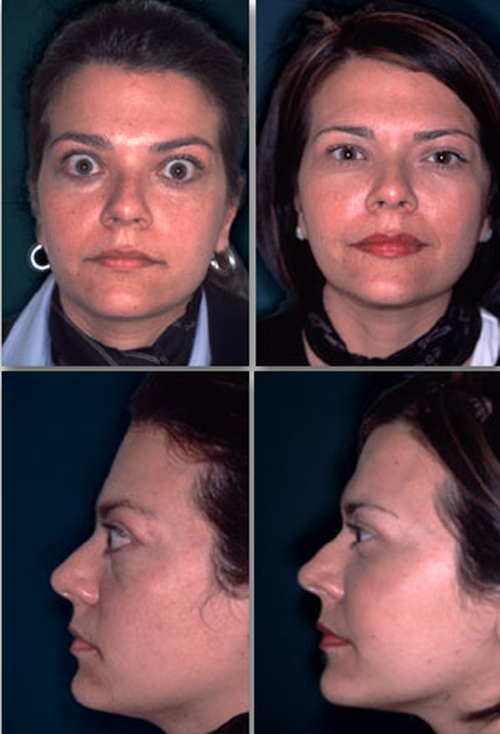 Dr. Yaremchuk corrected these problems by moving the eye socket walls, reconstructing the nose bridge and adjusting the internal socket walls. * This patient suffered severe head and eye socket fractures resulting in sinking in of his left eye (enophthalmos). Dr. Yaremchuk reconstructed the patient's eye socket roof, walls and floor in order to reposition the eye. * This woman had several attempts to correct the post-traumatic deformity which included bilateral ectropion. Dr. Yaremchuk augmented the temporal deficiency. Osteotomized and moved the zygomatic arch and corrected the ectropion with midface elevation and lateral canthopexy. * This patient suffered from a severe facial fracture (hemi-nasoethmoidal), which resulted in a misaligned eyed and the sinking of his left eyeball (enophthalmos). Dr. Yaremchuk repositioned and reconstructed the eye socket walls to correct the patient's appearance.